One month ago, Hamburglar Hadley reported in Grub Street the important news of a new taco shop opened in Mid-City on Venice Boulevard. I have a strong, personal identification with that particular boulevard! I was looking forward to it. This little shop was home to Hoagies & Wings, and then it became Wing Shack, which according to unreliable internet website Yelp! was really good. Wing Shack closed in May of this year to make way for a taquería, a sign of the times. If you compare this “before” picture, you can see what it takes to transform a Wing Shack into a Tacos El Paisano: you add some Hispanicizing puffy stucco around the top. The tiny building with about four dining tables is a fine environment in which to enjoy the simple pleasures of a taco meal. The menu isn’t too long, which is an asset in a taquería, because it highlighted what we needed – $1.25 tacos and Mexican sodas. Carmen smartly ordered two carne asada tacos and one each of al pastor and chorizo, so I followed her lead. The friendly serveur poked fun at me in English for not speaking Spanish as Carmen had. We had to drive past the nearby Venice and La Brea truck with its awesome trompo (literally a children’s toy spinning top, this word designates the vertical revolving spit of al pastor pork that resembles such a top). I remembered a line from Bandini’s recent review of Daniel’s Tacos: “al pastor that doesn’t come from the trompo only has so high of a ceiling.” True enough. Recent revelatory trompo experiences may be turning me into a serious trompo snob. 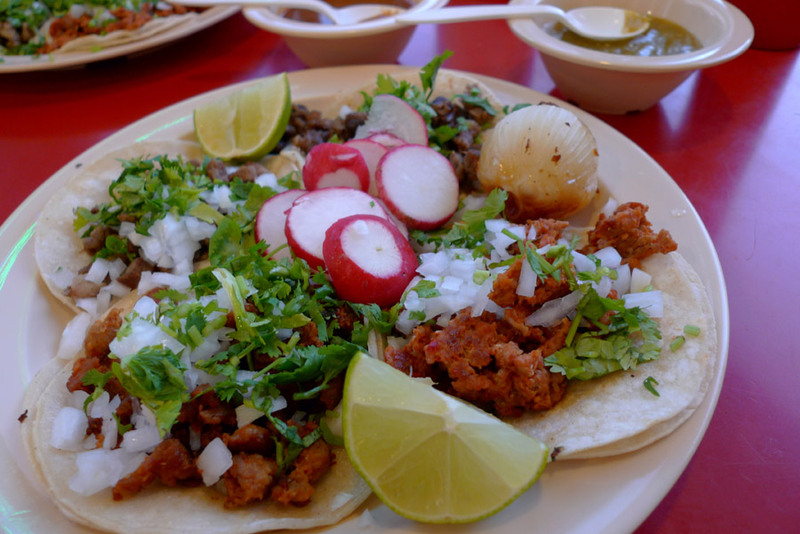 For non-trompo pastor, the tacos at El Paisano are quite good – thoroughly marinated and quite strongly flavored, with good texture; savory rather than sweet. Tacos were average in size, with satisfactory bilaminated tortillas, and served topped with onion and cilantro. Salsa was provided on the side in two bowls, red and green, both fairly spicy. Carne asada was good – I preferred the al pastor, but Carmen thought the steak was better. The steak had the butteriest flavor I have ever encountered, which Carmen likened to movie theater popcorn. That simile probably doesn’t make it sound very good, and in fact the taste is kind of freaky. I have previously noted a buttery flavor in good steak tacos which I attributed to the fattiness of the beef, but this time, we wondered if actual butter (or more likely the butter-flavored oil pumped onto popcorn at movie theaters) played a role. The chorizo pleased me too – this taco was the biggest, with chorizo in big charred-orange chunks; very salty, but a welcome counterpoint to the other tacos. The most distinctive aspect of our taco plates was the grilled onion – a medium entire onion served whole, but made sweet and delicious on the grill. One could eat such onions by themselves like bits of candy. I pulled Grilly apart and divided his remains amongst my tacos to spread out the joy. 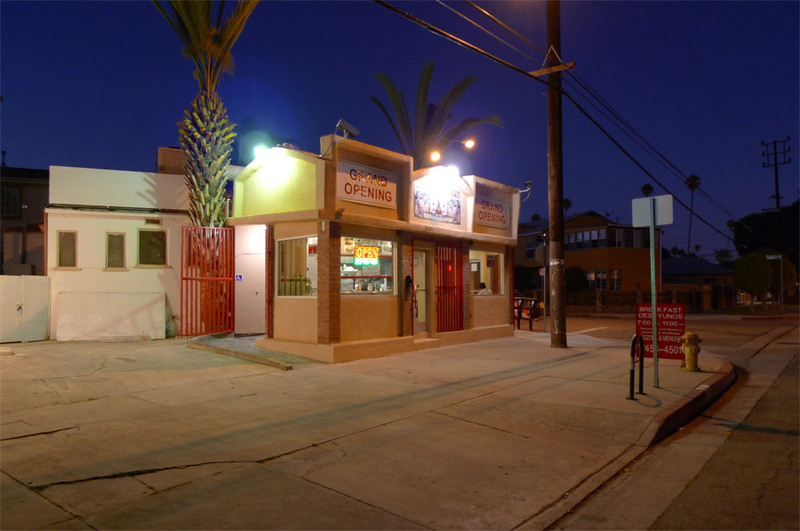 Tacos El Paisano provided a taco-righteous meal and dining experience. I don’t know how they are going to compete with the pork artisans down the street at the Venice and La Brea truck, but I always root for the underdog.